wow,what a lame mascot.couldnt they come up with anything better then that?they shoulda had some sort of contest and let the kids come up with something. That's such a great idea! Speaking of which, what would have been your entry? A squirrel would be better than this. You guys are losing it. Myself and an avid UNB fan were just talking about Prospect and have a question. What about the other Varsity teams at UNB? Does this mascot represent them very well? This suit couldn't have been cheap. I guess the only thing that matters at UNB is men’s hockey. At least a Squirrel would represent all the varsity teams equally, don’t you think? I have to agree that Prospect is going to look pretty silly at a volleyball or basketball game. (He already looks stupid at the rink.) Maybe he'll slip into a Speedo to promote the swim team!! 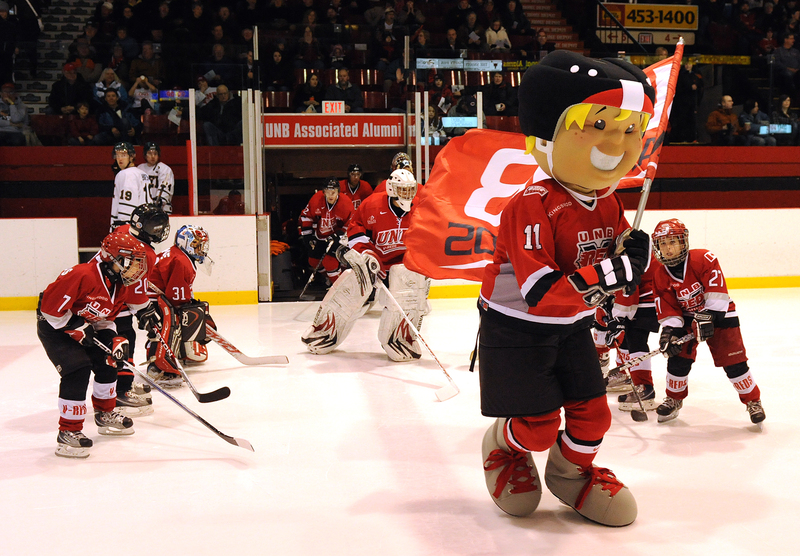 It's apparent that hockey is #1 at UNB. I think prospect was only the effort of those involved in hockey (including the prospects program)and nationals, and has nothing to do with the v-reds corporately. I'm sure if other teams wanted to organize volunteers and put forth the effort towards a joint mascot, the hockey team would be willing partners. All v-red teams undertake initiatives for themselves from time to time. As for hockey being number 1, yeah, most schools have favorites.